Now that the app has been updated to support iOS 11, I’ve added it back to my phone. It works great and does exactly what I need. We travel to Europe often and have a collection of recipes that need conversion. I was tired of using a calculator to convert measurements. This is pure genius! I love this application. Just what I've been looking for to get the right measurements for my recipes. The graphics are self-explanatory and intuitive. A must for anyone who enjoys cooking. Very annoying that you can't convert from solids to liquid measurements. This is a "Must Have" if kitchen measurement conversions isn't your strong suit! Great for any cook or chef. Very convenient for home use and use in proffesional kitchens alike. This is a MUST HAVE cooking tool!! 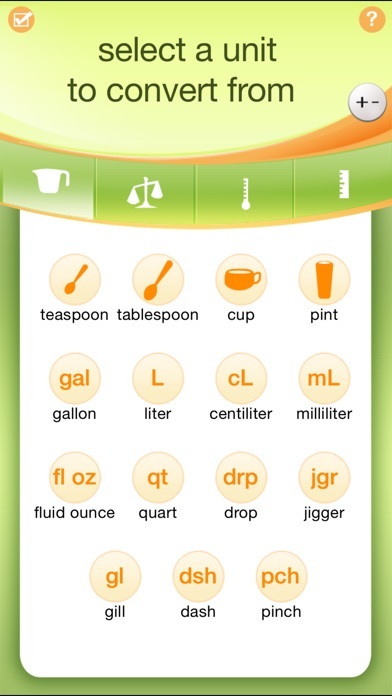 Kitchen Calculator is an innovative and intuitive cooking measurement conversion tool. Unlike other iphone converters, this one strictly focuses on cooking measurements and its graphics and user interface make this tool far superior to its competition. This is a MUST HAVE cooking-aid tool! I have had this app for many years. I do everything in landscape mode. I'm going to find another app that does landscape. It is very straightforward and has had all of the conversions I have needed so far. It really needs to be able to convert tablespoons to ounces. You can't convert liquids to solids even though recipes call for solid measuring devices for liquids. One could only hope they read this and add this feature. 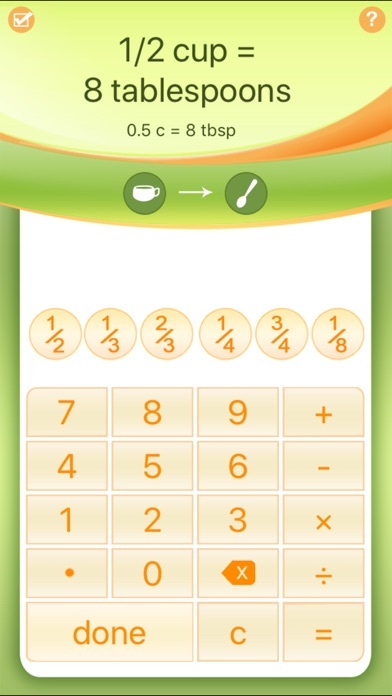 What I love about this app is that you can enter amounts in fractions such as 2 1/2 cups . This is a MUST HAVE feature that I have not seen in any other unit converter. Good job! I like this ap. i would just like to be able to be able to double measurements to see how much it comes to. it only lets you go from cups to gallons or tablespoons to cups. I'd like to be able to find out say what 3/4 cups times 2 equals. I am measurement challenged! Love it! Simple to use, have been looking for something like this. Do recomend. This version is a scam. This version only takes your money. Get the free version of kitchen calculator pro. Or go ahead and get ripped off. Let your calculator do the measuring! Very unhappy, iit does not work. It does not do anything. It will not let me input any thing to calculate. I live this app. Use it a lot. Simple, quick and accurate. Nice and simple, does exactly what I need for kitchen conversions. Thank you. I've used this app more times than I can remember! I've used it to avoid medical mistakes by converting my daughters weight from pounds to kilograms. I've used it to tell my Aussie friend how many kilometers my place was from his because he still can't figure it out in miles. I've used it when I'm cooking & need to reduce a recipe or increase the number of servings. I've even used it to figure out how much paint I'd need to paint my house! It's really easy to use & even more useful than I ever would've thought! Not as handy as it could be. Maybe I'm foolish for wanting this, but perhaps a volume to weight conversion. I know, it sometimes may depend on the material. But, something along the lines of 3 tsp to 1 tbsp to 1/2 oz to 14 grams would be nice to calculate on the fly. This was what I was looking for when I bought the app. If you are too, then it's not for you. What a fabulous cooking tool!! I've been looking for a tool like the kitchen calculator and it's finally available. I often look at foreign recipes and I've always spent a lot of time trying to convert the various measurements. Now, all I have to do is select the unit I want to convert and the unit I need, and it immediately converts it. I just love it and it's so easy to use! For those who want to make their life easier in the kitchen, here is your tool! Why is this app not up to date? When will this app be updated? Did the company go out of business? It’s a great app when it worked. Love this app and miss being able to use it. Please update for IOS 11 soon. With the new Apple iOS update the app does not work. It doesn’t even open! I’ve been using this app off and on and attempted to use it after iOS update and it will not work with the update. Please update the app! I use this app ALL the time- please update! This is my go-to kitchen conversion app & I'm so bummed to see it hasn’t been optimized for iOS 11! Please update! I don’t know how I will live without this app. It doesn’t work with ios11 please please update! !